Food for Thought: Unnaturally orange, tasting like banana, but shaped like peanuts: Circus Peanuts are one of the strangest candies around. They're orange, and they have the consistency of partially calcified nougat. To the average tongue, they taste like a hypersugary tropical fruit, only fake. When fresh, they tend to look stale, and when stale, they more closely resemble clay than food. To wary consumers, they appear to be soft mutant nut-blobs, as devised by evil scientists who've watched too many Loony Tunes. They are Circus Peanuts, America's most mysterious candy. On the list of all-time bizarre confections, Circus Peanuts rank near the top. Whether you like them or not, the sugary-foamy thingamabobs are an undisputed classic, a constant staple on most grocery store candy racks. Millions are consumed every year, especially around the holidays. But for every person who admits to eating Circus Peanuts, there are plenty of others who don't. Or won't. And wouldn't touch them with a 10-foot pole. "Circus Peanuts! They're loathsome," yelps river-rafting-geologist-turned-writer Rebecca Lawton, author of Reading Water. "They're kind of a fraud, too," she observes, "because they look like peanuts--at least they do when they come home in a bag of Halloween candy, when it's dark--so you think it's a big peanut, and you eat it and then . . . oh, wow! They're just God-awful! Do people really eat those?" Yes, Rebecca, people do, though some, like San Francisco comic Will Durst, can only stand to eat so many of them at a time. "I love the first Circus Peanut of the bag," admits Durst. "But if I have more than one, I'm in deep trouble, gastrointestinally. I'm telling you, watch out! Circus Peanuts are a trap--a soft, spongy trap." Circus Peanuts--let's just call them CPs--are difficult to explain, though one wouldn't assume so by reading the ingredients, which are neither complex nor mysterious: corn syrup, sugar, gelatin, artificial flavor, and artificial color. The taste is easy enough to describe: they are extremely sweet and taste of bananas--a banana-flavored peanut, that is. The texture, though, is even stranger. The average CP is chewy, but also gritty. It's gummy, but unless it's fairly old and crusty, it will melt in your mouth. Left to go stale--and there are those who do prefer to eat them that way--a Circus Peanut can become as hard as roofing material. That said, they are fairly pliable; a bored CP fan can mold the darn things into shapes--a cube, a worm, a little person--and then eat them. Circus Peanuts, in short, are one strange snack. Circus Peanut candies first appeared in the mid 1800s, when they were a seasonal item. They appeared in the spring, in candy jars alongside licorice whips and lollipops, and children bought them one at a time in 5- and 10-cent candy stores. 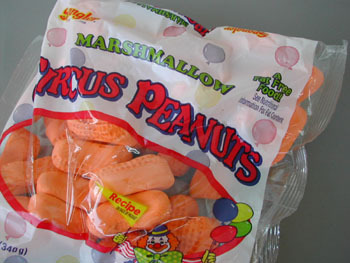 When polyethylene bags were invented, Circus Peanuts disappeared from the candy jars and rematerialized in plastic bags, which could be offered all the time, instead of just a few months a year. "Circus Peanuts are the polypropylene of candy," says Los Angeles author Hilary Liftin, author, appropriately enough, of Candy and Me (A Love Story). "If you had to go into space wearing one candy, I think Circus Peanuts would be your safest bet." Presumably, NASA has yet to attempt this. "The first thing you notice about Circus Peanuts," Liftin continues, "is that they're a grotesque, distorted, bizarrely colored candy. They look nothing like a peanut, they taste nothing like a peanut--and they're orange! A pale, faded, undeliberate sort of orange. And when you eat them, they're a slight lump of texture that doesn't really approximate anything organic." This from a person who actually likes Circus Peanuts. "I do like them, because they're really unique," Liftin says, clearly excited about discussing a favorite subject. "I like the texture of them--halfway between solid and foamy. The very first time I had Circus Peanuts, I was working a summer job at a trading office on Wall Street, which was completely not my thing, and I needed a candy that would be the antithesis to Wall Street. "My thought process went something like this: 'I can't believe I have to work this stiff job. What can possibly get me through it? Hmmmm. Those hideous candies I've never tried before just might do the trick.' And they worked. They helped get me through that horrible time in my life." Hilary Liftin is a connoisseur of candy. Not the gourmet kind. The other kind. Candy Corn. Bottle Caps. Necco Wafers. Meltaways. Circus Peanuts. Candy and Me is a chronicle of her confectionary infatuations, a hilarious and charming memoir, of sorts, in which candy becomes a metaphor for love and loss. "Candy is a simple joy," she writes. "It's a fun, tasty snack reminiscent of childhood. For me, candy has been the complex flavor of doubt, fear, guilt, hope, and love." In one particularly sweet story told in Candy and Me, Liftin describes a friendship that became bonded through the mutual appreciation of Circus Peanuts. "I'd just started a new job," Liftin says, summing up the tale, "and every day the woman in the next cubicle watched me snack on all kinds of candies from the vending machines. And I assumed she thought I was some kind of weirdo, some obsessive, weird candy lover, until the day she confessed to me that she'd always loved Circus Peanuts. Circus Peanuts! "What I find amazing about a candy like Circus Peanuts," Liftin adds, "is that it's the candy that everyone assumes no one else eats, yet there they are in every grocery store. So clearly, people eat them." Even in their earliest form, the squashy gizmos were known as Circus Peanuts, though any connection to actual circuses is only implied and largely unsupported by evidence. According to candy historians, the odd foamy fandangles have always been orange and have always tasted like bananas--though it is rumored that the banana flavoring was an accidental side effect from the experimental use of banana oil. Circus Peanuts have been manufactured by dozens of different companies over the years. Today, several companies--Brach's, Farley's, Spangler--make the gooey goodies, which is particularly odd since CPs are not a simple confection to produce. They are, according to Diana Moore Eschhofen, spokesperson for Spangler Candy Company in Bryan, Ohio, one of the most difficult candies a company can make. "The consistency is very hard to achieve," she says. "The ingredients have to be just right, the heat and the moisture have to be perfect. There are specific idiosyncrasies in the recipe that have to watched. Circus Peanuts aren't easy, but they definitely have a following. A devoted, faithful following." Spangler is one of the country's oldest operating candy manufacturers, and it's been producing Circus Peanuts since the early 1940s. According to Eschhofen, the demand for Circus Peanuts is so great that Spangler now manufactures the things 220 days a year, producing 18,000 pounds per day, for a grand total of 3,960,000 pounds a year--almost 4 million pounds of Circus Peanuts. And that's just counting those made and sold by Spangler. "There's a faction that doesn't love Circus Peanuts," Eschhofen says, "but those who love them seem to be winning the battle." Asked why they are called Circus Peanuts--why not Zoo Peanuts or Playground Peanuts?--Eschhofen insists that no one knows the origin of their name. "We've tried to find out," she says with a laugh. "We really have. We've asked people in the Spangler family. We've asked historians from Barnum and Bailey Circus. But no one knows. For that matter, no one knows why they're orange or why they're flavored like bananas. All we know is that, whether most people admit it or not, a lot of people love them. I took a bag of Circus Peanuts to a gathering recently, and it was like fish food time in a carp pond, there was a Circus Peanut feeding frenzy, and they were all gone within 10 minutes. "That," she says, "is evidence that people do like them. I'd just like to get more people to admit it."